A vision to create a fine setting was important to our forbears at First Church In 1909, a decision was made to beautify the facility which the congregation worshipped in since 1868. 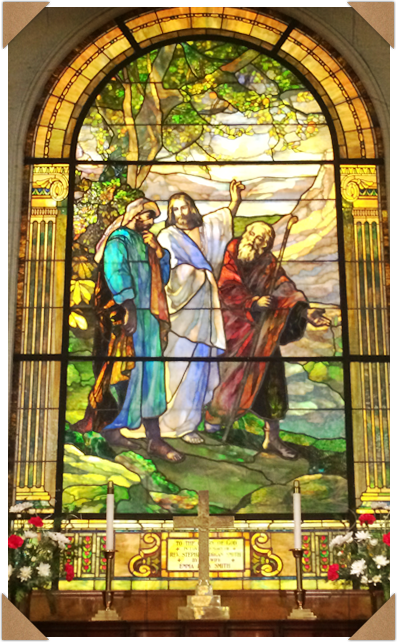 The John Rudy Studios of this City, as well as Philadelphia and Pittsburgh were hired by First Moravian to craft artistic windows for our sanctuary. By no means in appearance a typical Moravian setting and departing from the former Rostrum Saal setting, these members were led to emulate designs found in windows in Europe, and craft those motifs into the new windows. The juxposition of Austrian styling, Rococo influence, Anglican symbols and rich hues created a lovely setting, and were an asset to worshippers of that day – and continue to be to the Present. Dedicatory names hearken to late members and former Ministers of our illustrious, colorful past. The Chancel Window too is unique: A memoriam to Rev. S. Morgan Smith who died Easter Sunday 1903, was given by his widow, Emma Fahs Smith. Noteworthy to this awesome window, apparently is the only motif of Jesus, Cleopas and the third man en-route to Emmaus, designed under the personal direction of John Rudy, exclusively for First Moravian having several special facets: The lapis blue of Christ’s tunic, an overlay glass supplied by Louis Comfort Tiffany Studios of New York; the manufacture formula of this special glass was destroyed in a fire at their studios in the early 1910s, and has not been able to be exacted as shown to this day. Another unique feature is in the man left of Jesus: inserted at the heel of his foot is a triangular blue piece of glass; it is reported that the Rev. S. M. Smith sons, visiting Europe in the early 20th Century visited Prague, Poland seeking the Cathedral that Jan Hus, the founding Father of the Moravian Church preached from when serving his Lord as a Catholic Bishop. This cathedral lay in ruin from decay and neglect. From a rose type window over the chancel, a piece of glass was secured for installation in the Emmaus window. C. William Dize, a member of our congregation who passed away in recent years and eminent Architect in York recalled in his youth that John Horace Rudy, the artist whose studios created this marvel, and Mr. Rudy gaining in age would visit First Church regularly – sitting and visually drink in its artistry. He was reported to say that it was one of the most beautiful commissions he ever undertook and was glad it was around the corner from his offices so he could visit at will whenever the spirit spoke. 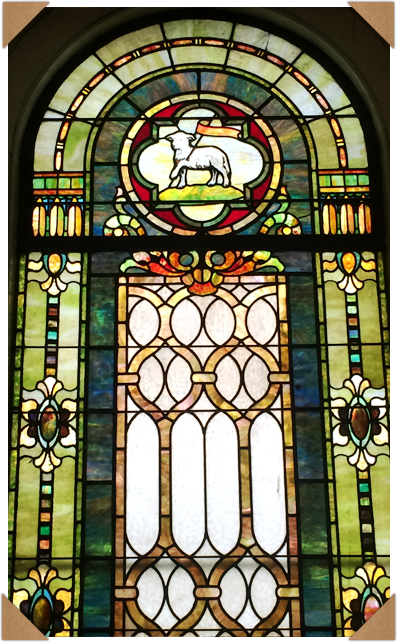 Other windows also inspire that the general Congregation sees, including the Narthex windows full of rich colors; but others are more obscurely placed, two in the former choir room, now serving for Pastoral preparation. 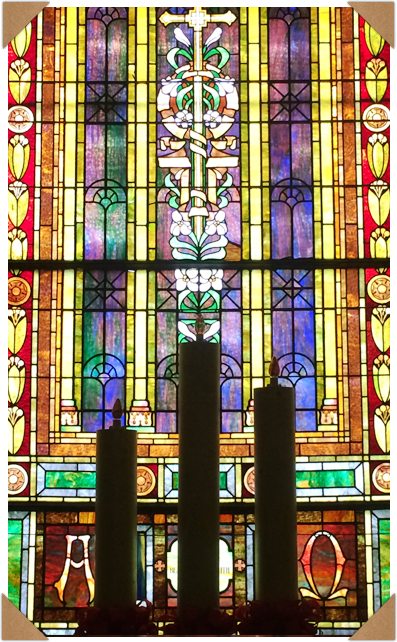 May we shine in our witness as the rich legacy of our lovely windows do!